"As Christians and Jews following the example of the faith of Abraham, we are called to be a blessing to the world. This is the common task awaiting us. It is therefore necessary for us, Christians and Jews, to be first, A Blessing To One Another"
An exhibit on Pope John Paul II and the Jewish people. While many in the Jewish community are aware of Pope John Paul II's revolutionary actions advancing Jewish-Catholic relations -- including his visit to the Western Wall and Auschwitz, his apology for 2,000 years of Christian anti-Semitism, his establishing diplomatic relations with Israel, and his being the first Pope to ever visit a synagogue -- many fascinating surprises lay in store for visitors to the exhibit "A Blessing to One Another: Pope John Paul II and the Jewish People." The exhibit is at the Kimmel Center for the Performing Arts in Philadelphia until December. Visitors not only learn of the Pope’s deeds, but also of what prompted the Pope to institute such radical, admirable changes in Catholic policies toward Jews and the Jewish state of Israel. Using photographs, video footage, artifacts, documents, newspaper clippings, and quotes, the exhibit succeeds in characterizing the Pope’s entire life. Visitors to the exhibit learn to appreciate Pope John Paul II’s life, from his youth in Poland to his papacy in Rome, which led him to revolutionize the Judeo-Catholic relationship. Rather than concentrating entirely on the Pope’s more famous accomplishments, the exhibit begins in his modest hometown of Wadowice, Poland, and illustrates how influences in his early life shaped his future life, decisions, beliefs, and accomplishments as Pope. A visitor is able to understand the Pope’s dedication to improving relations between Jews and Catholics. From his youth in Wadowice through the years of the Holocaust to his papal years, the exhibit concludes with his infamous visit to the Kotel [Western Wall] and an impressive 20-foot replica of the Western Wall into which visitors can insert prayers that will be taken to Jerusalem and placed into the real Western Wall in Jerusalem. 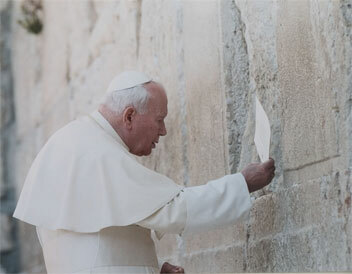 Pope John Paul II at the Kotel. Jews and Christians gathered on October 18th at the Kimmel Center for the opening of this exhibit, and enjoyed kosher food as well as passionate, eloquent speeches by both Rabbi David Gutterman, Rabbi of the Jewish Federation of Greater Philadelphia, and Bishop Joseph McFadden, the Auxiliary Bishop of the Archdiocese of Philadelphia. Rabbi Gutterman shared a personal connection to the Pope: his son-in-law’s grandfather, Jacob Smalanski, was born to Jews in Poland and given up to a Catholic family to protect him from the Holocaust. He was later refused baptism by the Pope, then a local priest, when the Pope found out that he was Jewish; the Pope said that his family must have wanted him to be raised a Jew. Julien Smalanski then became Jacob Smalanski, an active member of the Jewish community. Bishop McFadden praised the Pope who "denounced anti-Semitism as a sin against God and humanity" and who "recognized that all of us are sons and daughters of God, that we are all the same family, the family of God." Comparing both religions to a younger and older brother, the Bishop emphasized the bond between us and how the Pope had made a huge leap in the Catholic understanding of that bond and appreciation of Jews. At the opening, experts -- including Dr. Yaffa Eliach and Rabbi Ingber, both co-directors of the exhibit along with Dr. William Madges and Dr. James Buchanan – led visitors through the exhibit and spoke passionately of the Pope’s life, influences, and accomplishments. They described in detail every aspect of his life, including the influences that shaped him and his beliefs, and how he shaped the world. The section of the exhibit on the Pope’s childhood years, when he was known as Karol Wojtyla, highlights the prominence of the Jewish community in Pope John Paul’s hometown of Wadowice. With Polish music playing and church bells audible, it captures the spirit of the era and it depicts the unique nature of the city: welcoming of its disproportionately large Jewish community. This profoundly influenced Karol Wojtyla. One quarter of his school classmates were Jewish, as was his fellow soccer player and lifelong friend, Jerzy Kluger. Karol Wojtyla lost touch with Kluger for 27 years, but reunited with his boyhood friend after the Karol Wojtyla became a bishop. 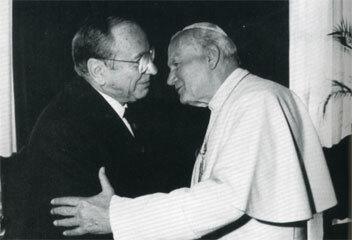 Pope John Paul II embraces his childhood Jewish friend Jerzy Kluger after 27 years of separation. When they were reunited, Kluger, well mannered and aware of proper etiquette, exclaimed, "Your Excellency," to which the bishop responded by asking Kluger never to call him that again. The two remained close friends for the rest of their lives, and Kluger referred to the Pope by his nickname from then on. The exhibit show photos of both Kluger family and John Paul’s family, with whom they were close. The exhibit also contains an accurate model of the town synagogue, which was later burned down and a 2,000-year-old Torah scroll rescued from Southern Poland. The section effectively captures the essence of John Paul’s childhood and the impact it would have on him later in his life. Visitors next pass through an impressive reconstruction of the gate of the Krakow ghetto, and into a chilling section on the Holocaust and its impact on the young Wojtyla. Germany invaded Poland when Karol Wojtyla had just started university in Krakow, and he lost many close friends in the Holocaust, which destroyed Wadowice’s thriving Jewish community. The memorial panel in this section contains the names of Wadowice’s 1,300 Jewish Holocaust victims as well as the Catholic victims who were murdered for attempting to help the Jews. The War Years section illustrates the tragedy of the Holocaust and their impact on the future Pope. In 1969, as a young priest, archbishop, and cardinal in Krakow, the Pope defied the rising anti-Semitism during the Soviet occupation of Poland by visiting the Remuh synagogue. While it is debatable how much credit for improving Judeo-Catholic relations should be credited to Pope John Paul II and how much credit goes to Pope John XXIII, who preceded him, this relationship was revolutionized by Pope Paul VI with the Nostra Aetate document at the Second Vatican Council in 1962 which transformed the Church's relationship with Jews by deploring "...all hatreds, persecutions, and displays of anti-Semitism directed against the Jews at any time or from any source." 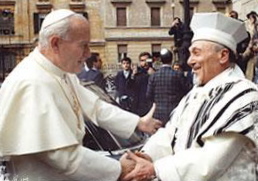 Pope Jean-Paul II embraces Rome's Chief Rabbi Elio Toaff during his groundbreaking 1986 visit to the Synagogue of Rome. The final section of the exhibit, dealing with John Paul’s Papal years, shows how he changed Catholic-Jewish relations. John Paul's legacy on this issue includes his infamous 1986 visit to the synagogue of Rome, the Vatican’s recognition of Israel as an independent state, and his apology for 2000 years of anti-Jewish actions by Catholics -- all of which were unprecedented for a Pope. Items contributed by the Vatican just one week before the exhibit was to open, including the biretta that Karol Wojtyla wore when he became a cardinal, his cane, and handwritten manuscript pages of notes for his speech at Auschwitz, are also displayed. To illustrate how radical the Pope’s changes in Catholicism’s view toward Jews were, the exhibit compares Catholic prayers concerning Jews before the Pope, in which Jews are called "treacherous," "faithless," and "perfidious," to a new prayer instituted by Pope John Paul II: "Let us pray for the Jewish people, the first to hear the word of God, that they may continue to grow in the love of his name and in faithfulness to his covenant." The exhibit concludes with a display about the Pope’s legendary visit to Israel, depicting his visit to the Western Wall and concluding with the replica of the Western Wall into which visitors put their own prayers. "A Blessing to One Another" is more than just a biography of Pope John Paul II, it explores the revolution in Jewish-Catholic relations and what brought it about, showing how Jews went from being treated abusively by Catholics to being considered equal children of the same God. Those who wish to gain insight into the life of Pope John Paul II and his crucial contribution to the Jewish-Catholic relationship should make it a point to visit this exhibit, which will enlighten them on the extraordinary changes that Pope John Paul II brought to the Catholic relationship with the Jewish people.